Ukraine has submitted an HIV/TB funding request worth $119.5 million, along with a $39.2 million prioritized above-allocation request. While the government prepares to assume responsibility for more services, Ukraine still faces challenges due to ongoing conflict in the eastern part of the country. The Global Fund’s gender strategy contains a strong commitment to addressing gender inequalities, but there is a major gap between policy and practice, a new study says. The authors found that too few grant agreements contain gender-sensitive or gender-transformative activities. UNAIDS estimates that ending AIDS by 2030 will cost about $25 billion a year. A quarter (26%) of this amount is required for HIV prevention. A new study from ICASO and EANNASO finds that the Global Fund’s current HIV prevention investments in Africa fall short of this benchmark. Across 15 countries, 15% of HIV and TB/HIV Global Fund grants from the 2014-2016 funding cycle are spent on HIV prevention interventions. The Global Fund’s policies on the composition of CCMs have had a big impact in Eastern Europe and Central Asia. The policies have resulted in increased participation of LGBT organizations on CCMs, and greater participation of LGBT representatives in the decisions of the CCMs and even of the governments in these countries, including decisions concerning prevention services, according to a new publication from the Eurasian Coalition on Male Health. ECOM also credits these policies with improving the quality of national HIV programs and with helping to combat homophobia. The I Speak Out Now! campaign encourages implementers to denounce fraud and other wrongdoing. Phase I focused primarily on three pilot countries. Phase II targets all implementers as well as the Secretariat. The Regional Center for Technical Assistance, host of the Regional Communication and Coordination Platform in Latin America and the Caribbean, organized a two-day “closing” meeting in Bogota, Colombia. One of the highlights of the meeting was the presentation of the results from three studies on technical assistance provided to CSOs in three countries: Bolivia, Dominican Republic and El Salvador. The Communities delegation is recruiting new members for the period August 2017 to August 2019. 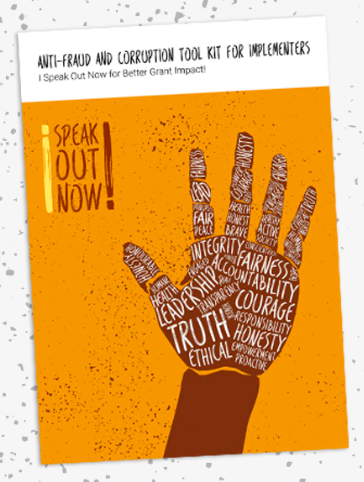 The Global Fund’s anti-corruption initiative, the I Speak Out Now! campaign, is now into its second phase. The purpose of the campaign is to encourage grant implementers and the Secretariat to denounce fraud, abuse and human rights violations in programs financed by the Fund. The Phase I campaign was designed to raise general awareness of wrongdoing and how to identify it. The campaign included a particular focus on three specific issues piloted in three countries: Côte d’Ivoire, Malawi and Ukraine. Phase II will target a broader audience of implementers as well as the Secretariat. While Phase I was the “Pilot” phase, Phase II is being labeled the “Sustain” phase. The OIG says that it is already moving towards Phase III (“Ingrain”), which is about embedding the anti-corruption initiative permanently within the Global Fund. Some of the Phase I activities will continue into Phase II. 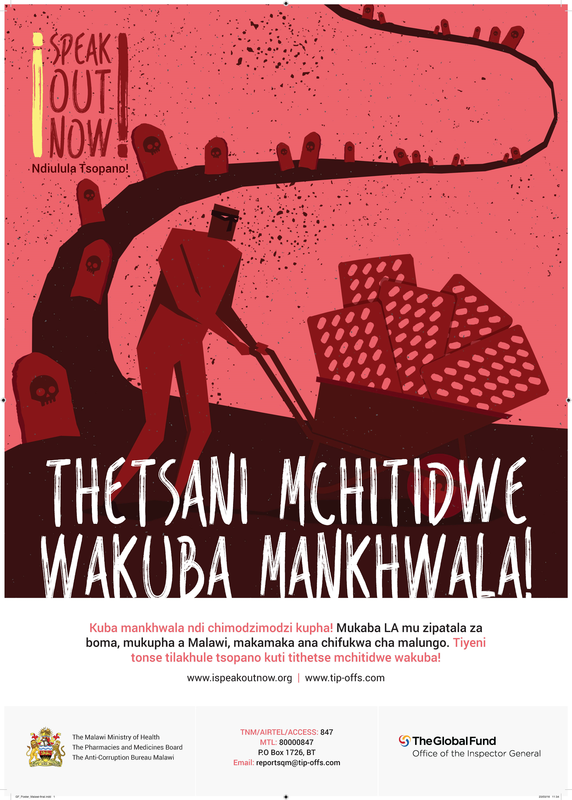 In Malawi, the I Speak Out Now! campaign was designed to encourage the local population to speak out about drug theft. Mass distribution of flyers through the supply chain – every box of drugs that left the warehouse contained the campaign’s flyers and posters – together with billboards and public service announcements on national radio, led to over 100 reports being made to a local hotline within a few months of the launch of the campaign. The campaign was launched together with a USAID campaign called “Make A Difference,” which also targeted drug theft. The OIG and the U.S. Agency for International Development (USAID) agreed to use the same local hotline provider and number to ensure a coherent and clear call to action for the local population. 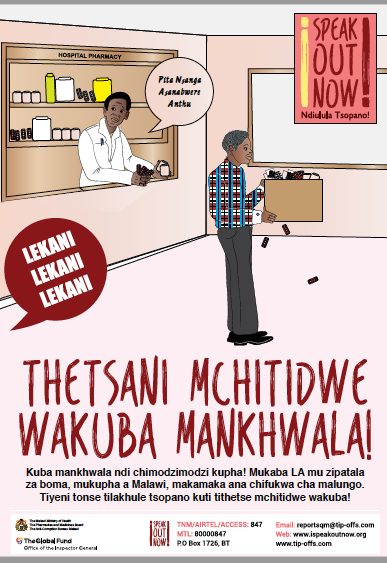 As a result of the reports to the hotline, an anti-malarial drug theft task force – made up of agents from USAID, the OIG and the Malawi Police Service – was able to act on intelligence from the reports which identified multiple sites allegedly selling stolen anti-malarial drugs. The task force subsequently found evidence that resulted in a number of high profile arrests, fines and prosecutions. The OIG told Aidspan that acting on leads from the OIG campaign, USAID and Ministry sources, Malawi’s Drug Theft Investigations Unit has made dozens of arrests in the past few months, most of which have led to convictions and prison sentences. More information will be made available in an OIG report to be published soon on the actions taken following the campaign. The budget of the investigations unit included $206,000 from a Global Fund grant. The OIG said that there is evidence that the Government of Malawi is now showing a greater commitment to the effort to reduce drug theft. The Ministry of Health has developed a Drug Availability and Security Action Plan, and the government has renewed funding for its investigations unit. In 2017 and beyond, the campaign will use the same approach as in Phase I – radio ads, billboards and distribution of flyers and posters. However, the OIG has changed the visuals and the messaging based on feedback that they were a little too “sophisticated” or “western-centric” for the Malawi market. The objective of the Côte d’Ivoire I Speak Out Now! pilot was to reduce the supply and demand of an unauthorized version of the anti-TB drug, RHZE. This drug was available by prescription through programs financed by the Global Fund. However, “unprescribed” versions of the drug were being sold in street markets throughout the country. The pilot identified that TB drugs were being bought by the public to treat other ailments. This has real public health consequences: It can lead to a multi-drug-resistant form of TB, which is far more difficult to treat. An investigation conducted by the OIG in 2016 found that the facility responsible for receiving, warehousing and distributing medicines, and a government agency acting as principal recipient for a TB grant, were jointly responsible for a massive theft of TB drugs financed by the Global Fund (see GFO article). In collaboration with the Ministry of Health and the country coordinating mechanism (CCM), an I Speak Out Now! campaign was launched, designed to raise awareness among the local population of the dangers of taking unprescribed versions of RHZE bought from street markets. The campaign consisted of a targeted distribution of flyers in health centers, together with public service announcements on national radio. The OIG believes the campaign contributed to a dwindling supply and demand for the illicit drug on the street. In early 2017, after the end of the campaign, nine nationwide street markets were surveyed. These where places where Global Fund–financed RHZE had been found for sale during the 2016 investigation. The survey found that the supply of the drug had dwindled significantly. Since the objective of the Côte d’Ivoire pilot has been achieved, the pilot will not continue into Phase II. In Ukraine, the I Speak Out Now! campaign addressed the problem of people who inject drugs being forced to pay bribes to get on to free opioid substitution therapy (OST) treatment financed by the Global Fund. In partnership with the local OST hotline, the campaign messaging focused on the many OST centers. However, although a local hotline received an increase in reports thanks to the campaign, a parallel investigative review by the OIG could not find evidence to indicate if, in fact, people who inject drugs were having to pay bribes. This suggested that the problem, if real, was not widespread. The Ukraine pilot will not continue into Phase II. Phase II will keep the I Speak Out Now! brand for implementers but will target all implementers. 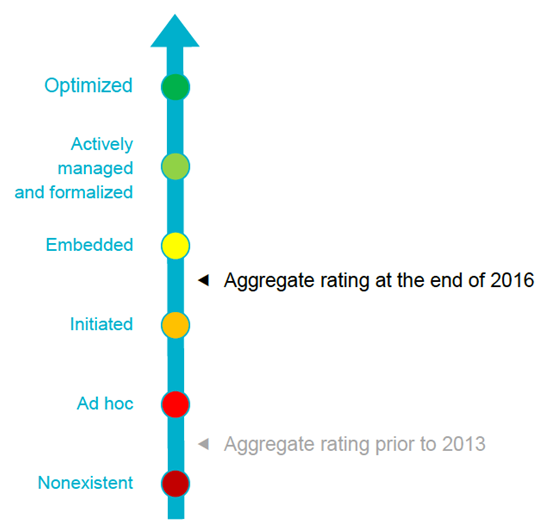 The objective remains the same – i.e. to encourage people to report problems quickly and provide quality information so that the Global Fund can disrupt wrongdoing as rapidly as possible before grant impact is compromised. At the same time, Phase II is being “repositioned” internally to emphasize the role of the Secretariat as a key player in partnership with the OIG, using the spin-off slogan We Speak Together! (This slogan will only be used internally.) The OIG said that it wants to encourage the Secretariat to come to the OIG more often and more informally to disrupt wrongdoing. The OIG said that it is beginning to launch new content and materials. The www.ispeakoutnow.org e-learning platform has been refreshed with new case studies, a news section, a resources section and more social media functionalities. As part of the new resources, the OIG has produced an Anti-Corruption and Anti-Fraud Tool Kit for implementers with seven tools in four languages. About 700 hard copies of the kit have been sent to principal recipients and CCMs. Whenever the OIG goes on mission, particularly the Investigations Unit, it uses the materials to train implementers, often through the CCM. For the Secretariat, the OIG has produced an animation video about the benefits of speaking early to the OIG. The OIG will also be holding internal training sessions and “brown bags” to raise awareness.